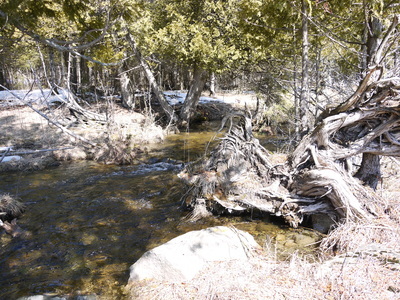 Due to the late nature of receiving CFWIP funding, Manitoulin Streams used the funds for materials for the rehabilitation of the Lower Norton’s Creek project, stream assessment on by College Boreal and the Brook Trout Eyed Egg Event. In the spring, 7 volunteers helped locate and remove the Scotty boxes from Norton’s Creek from the 2011 Brook Trout Eyed Egg Event. The Scotty Boxes were cleaned out, remaining dead eggs counted and Javex was used to sterilize the boxes for 2012. These activities took 4 hours totaling 28 volunteer hours. One of the volunteers provided lunch and the use of a four wheeler and trailer. 6m of wire mesh installed under bridge to prevent beavers from blocking water flow. 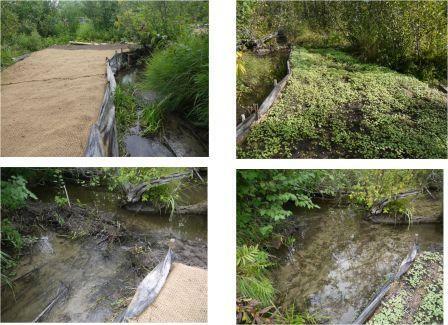 This project had 7 volunteers participate from the Board of Directors of Manitoulin Streams in planning and actively volunteering at rehabilitation sites. The total number of hours volunteered for this site is 51.4. Four volunteers helped with rehabilitation work at the site for a total of 18 hours. A chainsaw was used to cut cedar slabs to create the fascines, the use of a four wheeler and trailer were used to transport cedar slabs and sandbags to block off beaver channels. Ontario Rangers had 2 leaders and 12 rangers help out with building the fascines, removing beaver dams and placing sandbags along the channel, a total of 182 hours. College Boreal came with 11 students and 1 professor and conducted electro-fishing and invertebrate surveys along Norton’s Creek in order to determine the status of the brook trout population in the creek for a total of 96 hours. Four electro-fishing sites and 2 invertebrate assessments were conducted. All information has been given to the MNR to enter into the NRVIS data layer. Manitoulin Streams held a brook trout eyed egg event on Dec 12th 2012. In preparation, gravel was cleaned and washed of sediment by 4 volunteers (4x2hrs=8hrs) and placed into bags to have available for the sites during the winter. The day before the event 3 volunteers helped to transfer water from the creek to the facility, help with the set up and transfer of the gravel out to the site locations along the creek. A total of 10,000 brook trout eggs were transferred into Scotty boxes and stocked into Norton’s Creek. There were a total of 62 volunteers that provided 3 hrs of labour for a total of 186 hours. There was a donation of from Orr’s Valumart and a donation from the landowner for BBQ supplies to feed the volunteers. The landowner also allowed the use of his facilities, heating and hydro to hold the event. The use of a quad and sleigh to transfer the coolers with the Scotty boxes out to the sites was provided by a volunteer. Media (Expositor and Recorder) were present and an article was placed in the newspapers.